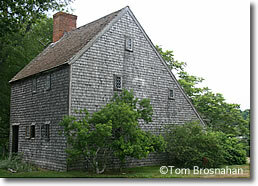 The simple, homespun design and decoration used in early New England has become what we think of as Colonial style. New England colonial public buildings usually consisted of the meetinghouse (what others might call a church). This, though larger, was simple as well. 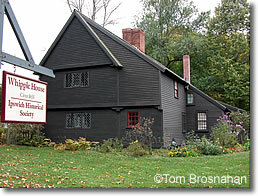 New England preserves a remarkable number of buildings from colonial days. 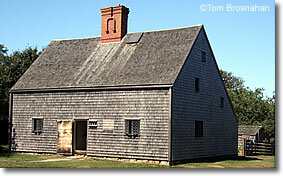 For a look at buildings remaining from the 1600's, visit the Hoxie House (1637) in Sandwich, on Cape Cod, or the Whipple House (1640) in Ipswich, on Cape Ann, north of Boston. Plimoth Plantation, near Plymouth, Massachusetts, gives perhaps the best glimpse of life and architecture of New England in the 1600s. Above, Hoxie House (1637), Sandwich MA. Below, Whipple House (1640), Ipswich MA, on the Massachusetts North Shore.